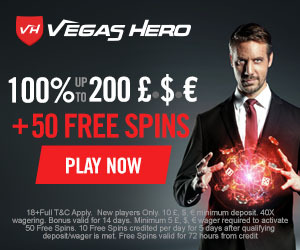 Vegas Hero Casino Review 2019 - The Hero We've Been Waiting For? You can be the hero when you play at this brand new casino. Vegas Hero was launched in 2017 and takes a quirky approach to online gambling. They boast that this casino offers ‘the possibility to make dreams come true’ via their excellent selection of games and powerful promotions. This is no traditional online casino, but part of a new breed of online gaming sites which puts the player front and centre. WHAT IS Vegas Hero Casino? Vegas Hero is operated by the Genesis Global Limited corporation, who are also behind popular online casinos like Casino Cruise, Spinit and Sloty. These operators certainly knew what they were doing when they created Vegas Hero. Like so many of their other online casinos it has a distinctive style all of its own. The incredible game selection capped with excellent promotions and a hip style make this casino stand out from the crowd. A big casino deserves a big welcome bonus, and that’s just what you get when you sign up with Vegas Hero. In total you can claim bonuses worth €1,000 along with 50 free spins over the course of your first four deposits. Just a minimum deposit of at least €10 is enough to claim the first deposit bonus, but after that don’t forget to use the bonus codes WHERO2, WHERO3 and WHERO4 to claim the next three. Free spins come in batches of 10 for five days, with winnings from these capped at €100. There is a wagering requirement of 40 times the bonus amount before it or any winnings can be withdrawn. Go to the Promotions page to discover the additional bonuses on offer from this exceedingly generous casino. There is no shortage of ways to make a deposit at Vegas Hero Casino. All the usual suspects are here, including Visa, Mastercard, Skrill and Neteller. If none of them suit, then there are some interesting alternative options include Boku, Trustly, EcoPayz, Entropay and Paysafecard. Both deposits and withdrawals are free of charge, and the site endeavours to process withdrawals within 24 hours of their being requested. €10 is the minimum for both deposits and withdrawals, and you can withdraw up to €2,300 per transaction. Don’t forget to verify your identity early so as to ensure that there will be no delays when your withdrawal is requested. Overall withdrawals are limited to €5,300 per week and €22,000 per month. Live chat, email and telephone are the three ways players can get in contact with the support team at Vegas Hero. Customer support is not 24 hours – unfortunately – but if live support is unavailable you can send an email which will be answered within 24 hours. English, German, Swedish, Norwegian and Finnish support is available. The operators of this casino have a very good reputation and you will be able to play at this site with full confidence. Vegas Hero truly is a superhero among online casinos. There is so much to like about this casino that we have awarded it one of our highest scores, with only its lack of a loyalty programme and 24 hour support holding it back from being a ten out of ten. The quality and quantity of games available here pushes it into the top rank of online casinos, and the number of promotions will make it a favourite among casino gamers. This is a very new casino but we predict bright things in its future. Vegas Hero is a truly awesome casino with everything a player could want under one virtual roof. The selection of games is up there with the best in the business, and we love those promotions for both new and existing players.